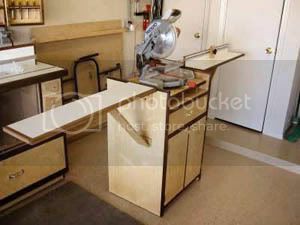 The Tool Crib – 11 Free Miter Saw Stand Plans + 9 Pictorial Idea Guides, 2 Videos, 6 Paid Plans and MORE! 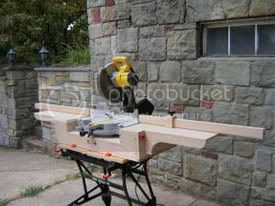 What good is a miter saw if you don’t have a stand? 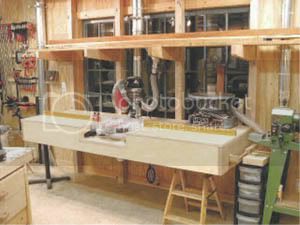 As one forum poster said: “I’m tired of putting my chop saw on the floor!” Let this free miter saw plan collection inspire your next project, whether you’re building a mobile miter saw stand for your shop or a miter saw station with 16′ of bench. In addition to plans we gathered pictorial/tutorial walkthroughs that don’t have plans but are filled with great design ideas. 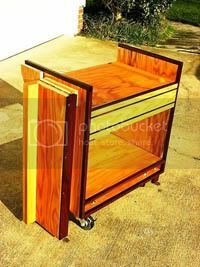 If you review all the plans, ideas and photos in this DIY miter saw stand collection you will undoubtedly agree that these three deserve honorable mention above all others. Not necessarily because you will build them… But because they are several cuts above the norm (…or Nahm I guess you could say ;)) Two of these three include plans. 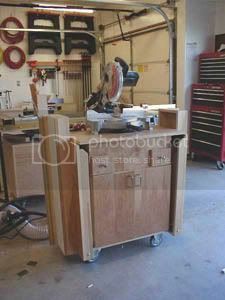 Here are the miter saw tables, stations and stands – shop mobile as well as jobsite mobile – I could find in my research. These 8 all include plans (or approximations of plans), as opposed to the build write ups and “tours” just below. 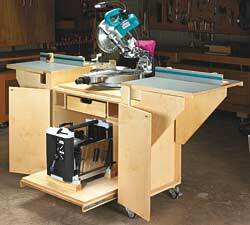 It seems that miter saw tables invite more modifications and variations than other plan collections I’ve made in the past. I think this is largely because so many woodworking forum-goers use these pictorials and construction notes to convey their build process. These include more design tweaks than the plans above, however they require a higher level of design-it-yourself ability. 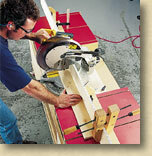 Norm’s miter saw station/workbench -Great discussion of making modifications to Norm’s plans. For the most part I found the build galleries in forums, along with links to the paid plans… For those in the planning stage, reading through these threads may provide little sparks of insight and ideas. 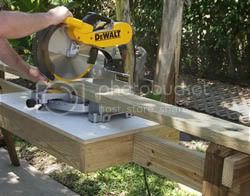 Help me design a miter saw stand. 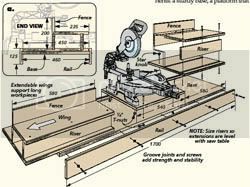 Miter saw station plans anybody? 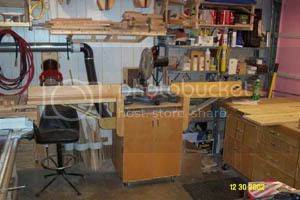 sliding miter saw work station ?? 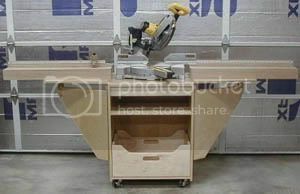 Where can I find plans for building a stand for my compound mitre saw? 12 Router Fence Plans: From Split Fences to Micro Adjusters! Thank you so much for this compilation of great ideas. 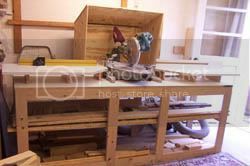 I’ll be making up my own design but this really helps as a starting off place for my miter saw station. I”ll post my design as soon as I’ve figured it out! 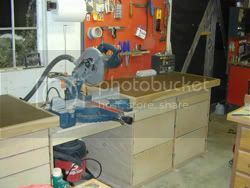 I love Toolcrib! So many great ideas. 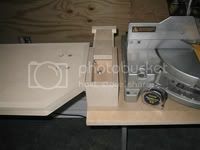 I recessed my dewalt miter saw in my workbench years ago, but it was a quickie job maybe it’s time for a redo??? This is off topic, but toolbatt.com is giving away a 12 volt Dewalt drill if anyone wants to enter. Thanks for the great ideas!